Puducherry is a Union Territory and is bound by Tamil Nadu. Pondicherry is the capital and also the largest city. While it may occupy a very small area on the map, it is big enough to leave people mesmerised and wowed. This sunshine city was under the French rule until 1954 and hence has strong French influences to its architecture, food, culture and just about everything in Pondicherry. This is one destination that is perfect for people of all ages. It wouldn’t be wrong to call Pondicherry, a French delight tucked neatly in an Indian wrapper. Whether you decide to take a trip with family or friends or just travel solo, Pondicherry is the perfect destination to relish vacation time. There are some interesting places to visit in Pondicherry. With interesting hotels, restaurants and everything that has a French sub-continental touch to it, enhanced by Indian creativity and design, Pondicherry is magical. Auroville is the place which draws a lot of people in search of spirituality. Pondy as it is fondly called is a melting pot of vibes. It is more like the old world catching up with the new world. The older French part of town is where you will find quiet, clean streets with colonial houses which add warmth of a different type. From yoga to meditation, from good food to fabulous shopping, Pondy is the place to be. Here is our compilation of the places to visit in Pondicherry, and trust us; you won’t regret taking this trip. The Paradise beach is approximately 8kms away from Pondicherry. Known to be one of the most popular beaches in the Pondicherry tourism scene, a visit to this beach is highly recommended. Everything about this beach is noteworthy. The shoreline, food and even the air is simply exquisite and elegant. The most common means of transportation here is the ferry ride. So while you are here, take a dip in the sea but don’t swim too far away from the shore or simply enjoy a game of beach volleyball. Travellers are not allowed to bring in eatables to the beach, thus reducing the beach litter. When in Pondicherry, don’t miss taking a walk down the Paradise beach. Distance from the Airport: Approximately 150kms from the Chennai Airport. There are some places that cannot be described in words. The Promenade Beach is one such. The views will leave you speechless and jaw-dropped. Stretching for approximately one and a half kilometres between Pondicherry turf and the Bay of Bengal, this beach is enormous in area. Landmarks like the War Memorial and the statue of Joan of Arc are places where history talks for itself. The beach is kid-friendly and hence quite a popular one, especially among children. Play some beach volleyball or go swimming or simply soak your feet in the sand and waves as you watch the setting sun. 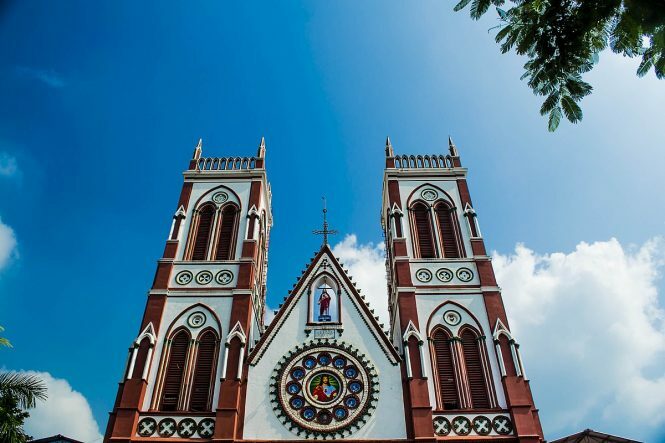 The Basilica of the Sacred Heart of Jesus is situated in Subbiah Salai and is one of its kinds. Built by the French missionaries in 1908, the church is a perfect example of Neo-Gothical architecture. This is the place for anyone who would like some peace and serenity. The church also attracts a lot of history and photography buffs. Distance from the Airport: Approximately 148kms from the Chennai Airport. 71 kms away from the city of Pondicherry, situated in Villupuram district of Tamil Nadu is the Gingee Fort. Commonly known as the Senji Fort, this one is known for its excellent architecture. The British nicknamed it the “Troy of the East”. Its art has made it one of the popular tourist destinations. Distance from the Airport: Approximately 135kms from the Chennai Airport. 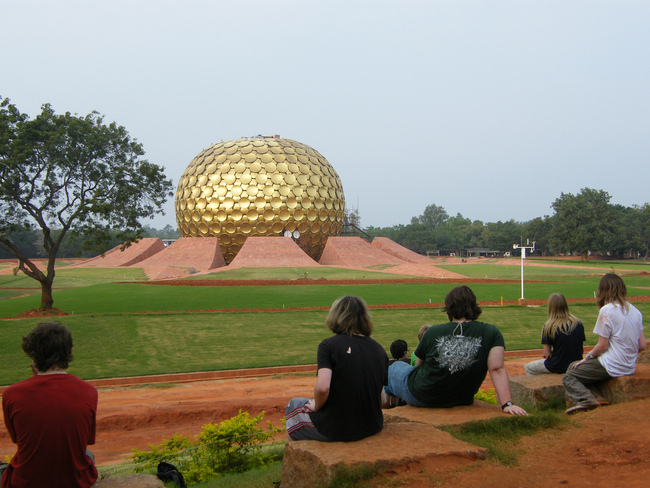 Auroville is synonymous with Pondicherry. This experimental township is situated in Villupuram in Tamil Nadu and a part of it is also located in Pondicherry. The town was built with an aim to promote harmony. The brain child of Roger Anger, Auroville was built so that men and women from across the world could come and live here in peace. This is one place which should not be missed, when on a trip to Pondicherry. There are many people who visit Pondicherry solely with the purpose of serving others. This is the place where yoga, meditation and helping others are a way of life. People can be found meditating at the Matri Mandir. A lot of travellers choose to volunteer by cooking meals, guiding tourists and keeping the place clean. Distance from the Airport: Approximately 142kms from the Chennai Airport. Sometimes all you want to do is take a break from everything and just sit and watch the sun set. The setting sun, the pleasant breeze and the beautiful views are mood changers and the Goubert Avenue offers just that. There are quite a few things to do in Pondicherry. No matter what you choose to do you are sure to have a great time. Pondicherry tourism has some brilliant initiatives to give travellers an experience of their lifetime. While you can opt to travel on your own, there are many tour operators who provide Pondicherry Tour packages for a hassle-free holiday. While in Pondi, you can do quite a few things however, here is our recommended list of things to do in Pondicherry. If you are visiting Pondicherry in May, then don’t forget to attend the Villianur Temple Car festival. The festival is celebrated in the honour of Lord Thirukamemswara Kukilambal. The chariot is decorated and a procession is taken out the temple premises. The festival is attended by people with a lot of enthusiasm and excitement. 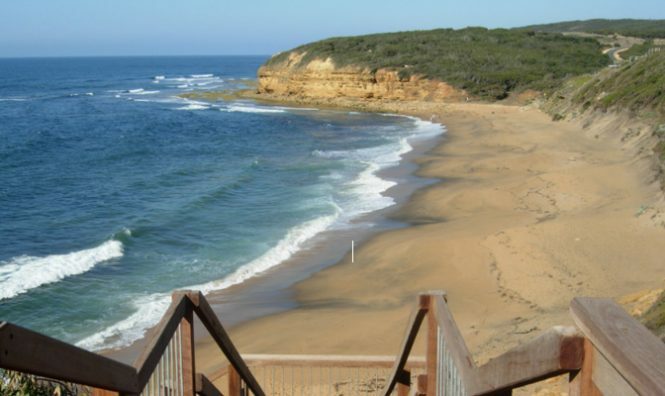 Take a walk on the Serenity beach or simply sit and watch sun and waves play peek-a-boo by the beach. If you are the more adventurous types, you might want to try surfing. The Kallialay Surf School at the Serenity Beach give you quick lessons on surfing and allow you to surf at the beach. If surfing is not really your thing, then simply pose with the surfboard. The Ousteri Lake is approximately 10kms away from Pondicherry and is a great place to watch birds. With a beautiful view, this freshwater artificial lake is a hot favourite among photographers and ornithology enthusiasts. Pondicherry has something for everyone. Take a plunge in the pristine waters of Pondicherry and explore the undersea life there. 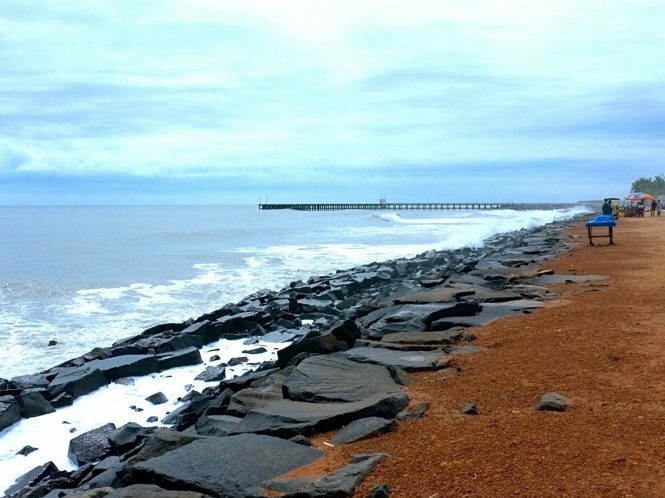 The eastern coast of Pondicherry is well known as the scuba spot. You can do some quick learning or take a comprehensive course in Scuba diving. Wondering if Pondicherry has any nightlife? Yes, while this city might be known for its meditation and yoga centres, it has its own charming night life. Cheap liquor, lively music and dance scenarios under one roof are quite a thing here. Pondicherry is home to some interesting pubs and lounges. Some lounges have accommodation options too. Pondicherry is equally well known for its water sports and this is a treat for all those adrenaline junkies who love to test their limits. The Karaikal Beach is where one can try canoeing and kayaking. The waters are rapid and rough and this indeed adds to all the thrill and fun. Isn’t this a reason good enough to plan a visit to Pondicherry? Indulge in some retail therapy when in Pondicherry. Pondicherry has some pretty boutiques where you can shop till you drop. Be it window shopping or buying stuff, Pondicherry will not fail you with its charming boutiques and shops. The Saram China market is the place to go if you are looking for decorative items and electronic goods. You will find a lot of products at prices that are easy on the pocket. You might want to brush on your bargaining skills before you go shopping. While in Pondicherry, explore the city on bicycles. All you need to do is rent a bicycle and cycle your way across the city for a sightseeing tour. The special initiatives taken by companies like Pondy Cycle Tour to promote cycling are commendable. Auroville is all about harmony; however one need not meditate all the time to get some peace. A lot of people find their peace by volunteering for the numerous initiatives run in the township. You can simply cook, clean, guide tourists, help farmers in their fields and do a whole lot of other things just to learn something new and interesting. Auroville is all about experience, an experience that will leave a lasting impact on you. Pondicherry is a destination that has something for everyone. From history to photography, from spirituality to a vibrant nightlife, from sun, sand and the turquoise sea to the quaint boutiques, Pondicherry is all about charm. Pondicherry has tugged on to its French roots and also made room for the Indian influences. It has the best of both worlds and yet is completely distinct in its own way. Pondicherry is not just a destination, it is an experience that you would like to live, experience and carry memories of.